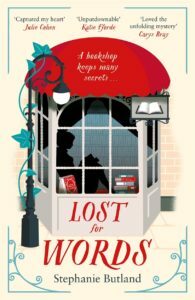 Lost For Words by Stephanie Butland is a beautiful and powerful contemporary novel that will stay with you long after the last page is read. Set in a second hand bookshop in York, the reader is in for a real treat – books within a book. Books that will evoke memories. Familiar quotes. Plus a ‘dear reader’ transported this reader back in time and place. A paradise for the book lover and an absolute delight. The novel is about love, loss and life. It is beautifully written. The reader ‘feels’ the conflicting emotions of the lead character. We understand her motivations and why she seeks solace in books. Being written in the first person enables us to really get into the head of the character. The story alternates between present day, three years earlier and 1999, as the back story is gently unravelled.